K&K True Value has been known for great customer service for over 75 years. We have always believed in supporting the local community, and have a long history of youth and senior sports sponsorships, donations, hosting groups selling raffle tickets, blood drives and other outreaches. In 2017 K&K decided to take it to the next level for community support. 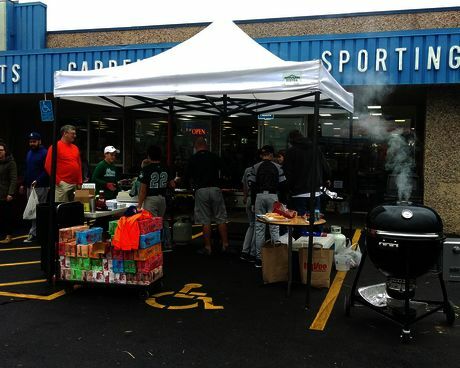 The first Saturday of every month, from March thru October, K&K hosts a grill out in our parking lot benefiting a charity in the local community. The charity or not for profit group receives the profits from the grill out. We now have the routine down: K&K purchases hot dogs, brats, buns, sodas, condiments and other supplies needed. Advertising the event on Facebook and encouraging the charity to share it with their followers. We get the grill, tent, tables and coolers set up and ready. The local charity volunteers arrive to do the cooking, selling, serving of the food and collecting of all money. Selling the items at a low cost helps encourage impulse sales. $1 hot dogs and $1.50 for brats keeps the grill busy. Many volunteers leave the event pleased with the experience, expressing their surprise at the amount of support they have received and amount of funds raised. Last year the charities ranged from youth sports teams, a local pet rescue, and the local Big Brother Big Sister group. Our customers appreciate the events, grabbing a cheap lunch as they stop in for items they need for their projects. K&K feels proud and grateful to the community has provided us over the years and is happy to be able to share the support with local groups. Next season’s grill outs are already planned and we can’t wait to start them back up!